Supermarket drifting fun! 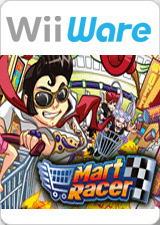 In Mart Racer, you are a sharp-elbowed shopper racing through the store to find items before your rivals do. Use your Wii Remote controller like a handlebar to control your shopping cart as you race through different types of stores. Vex your competitors by stunning them with plungers and stealing groceries out of their carts. Outrun them by using your drifting and aisle jumping skills. And keep away from the security guards who want to stop the mall melee. First one with a completed shopping list at the cash register wins! Mart Racer is a simple and fun game suitable for all ages that pits you against the computer or up to four players. You can play with your friends and family on a split screen, or with others online through Nintendo Wi-Fi Connection. The graph below charts the compatibility with Mart Racer since Dolphin's 2.0 release, listing revisions only where a compatibility change occurred.